Today, I am a mother above all other roles. I take it for granted that when I say goodbye to my son each day during drop-off, I will see him back in my arms again later in the day. Like all over you, I am heart-broken and sickened by the sinister act of violence that took place in Newtown, Connecticut today. While nothing I say or do will help those grieving parents, family of the brave faculty members, and the traumatized children who've had to witness the events, I do want to give my thoughts and condolences. It's been an emotional day. This enlarging string of violence in our country needs to somehow come to an end. #1 Do not floss on the train. I don't want to see or be in close contact with anything from anyone's mouth. #2 Do not style your hair with hairspray while on train. The rest of us do not want hairspray in our faces! #3 Do not paint your nails! BART already smells bad enough. We do not need nail polished in tight quarter! It stinks, please do it at home. #4 Men, don't shave with your electric razors on BART. It's loud and it's annoying. If you don't know already from all the signs decorating the stations, this is BART's 40th year. I am still deciding if that's something worth celebrating or that's confirming that BART is long overdue for a makeover and upgrade. 40 years of wear on the tracks; 40 years of stains and spills on the seats and carpet; and 40 years of skin tissues and dander on the cushions, among other things. But the truth of it is, we are all better off because we have BART as a commute option. (No, no one paid me to say this.) I recently had to drive to San Carlos for work from Orinda and the 3 hours roundtrip gave me plenty of time to think through all the benefits BART brings to commuters. Not only does BART save time, it's probably saved plenty of hairs on my head as well, since I am not constantly tugging at it due to traffic frustrations! So, for the moment, all criticisms aside, Happy 40th anniversary, BART! Bikes on BART today! Did you mind it? First, while I know why they are doing it Friday, it significantly skews results because Fridays are light for bikers and non-bikers. I haven't seen a single bike today so of course my reaction is....no negative impact, totally OK.
Second, it's rarely the actual bike (well, sometimes) that passengers can't stand. It's the biker and how he or she handles the bicycle in the train. Some know to line it to the side as quickly as possible or just not enter when it is packed to the door, others feel they have the right of way and will jam on your feet to get themselves positioned. So, don't forget to share you feedback today but incorporate your reaction to train conditions on any other days when you share the train with bikes, and not just today, a light happy Friday! Question: Would you rather sit next to a homeless or stand? This question has been on my mind for a couple days now. Call me weird, but I prefer to stand, even when exhausted and jam-packed in a tight train, than to sit next to a homeless man. This has happened a few times. You spot an empty seat, but see people standing around it, you think you've won the lottery by getting a seat, only to see just WHY it was empty! Let me clarify, the homeless man smelled heavily of alcohol and human waste. The seat was left empty for 3 stops, then a woman bravely took it. The homeless man stretched his arms open and hit her in the face. She cringed but remained seated. What would you do?? Take the empty seat next to the homeless man or stand? **This marks BART Musings' 600th post!! Thanks everyone for sticking with me and hearing my rants! After years of complaining about the smells around the Civic Center station, and more recently with a job change, the Powell Station, it is confirmed that there is, in fact, plenty of daily human waste being let out at the escalators and surrounding area. When a friend shared this SFGate article on Facebook today, I knew exactly which stations they are talking about!! I've heard it, smelled it and seen it for years! BART spokesperson Jim Allison says that BART officials must witness the action to cite. I, along with many other colleagues, have seen it happen plenty of times. I've seen fresh urine dripping down escalators and stairs from the top. Now if only BART police is present more often?!? I've seen feces piled up in a corner, I've seen pee, puke, you name it. It's not that hard to witness...just hangout near the exits during 8-9am when most of the homeless occupants wake up. There is a later crowd (the drunk ones) that wake up past 9:30am...follow them, and you will find the way! Matier and Ross posted something disturbing but not surprising on SFGate yesterday. There are currently 28 BART escalators out of service and many have been out of service for more than 3 months. The escalator that I frequent in Powell Station has been out of service for at least 2 months. It's sitting there collecting layers of fallen leaves, trash, urine, you name it. This is ridiculous!! I've seen people with large suitcases having to lift their load upwards step by step and people with injuries or disabilities grimacing in pain as they walked up or down the stairs. BART is so poorly managed and views customer service as a low priority, if a priority at all. Just the other day, there was a turnstile with a jammed ticket (one of two open turnstiles during prime commute hours), and no booth agent in sight for at least 5 minutes to help fix the machine. Lines getting through the ticket turnstile became enormous. And is it too much to ask for the booth agents to actually politely answer a question from a tourist?? If you're working at the Powell Station, EXPECT tourists to ask questions about where to go. It is part of the job. Don't just point to the map! You are an agent, you provide service, so put in some effort to actually help someone from out of town. 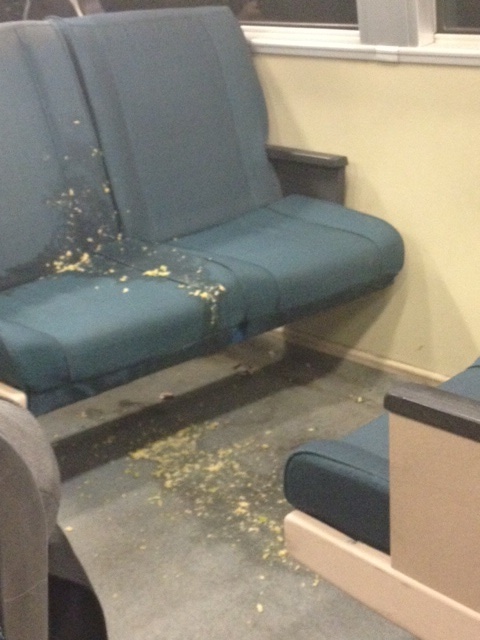 Enough griping for now but this is just another example of how poor service is on BART. What is this? Only a couple things come to mind and neither are pleasant to imagine. 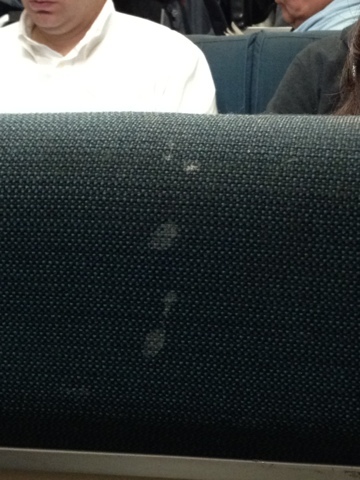 We badly need plastic seats on BART so we can avoid close contact with bodily fluids (or whatever it is) of any kind. I finally had a chance to ride in these highly anticipated non-cloth seats that could be wiped down every so often and doesn't collect stains, dander, fluids, you name it. My two cents? They may be hideous but they are undoubtedly more sanitary. When there is a serious passenger violation, I can whip out my bottle of Purell and do my own sanitization. The designer, however, needs to be fired!! Look at these hideous colors!? 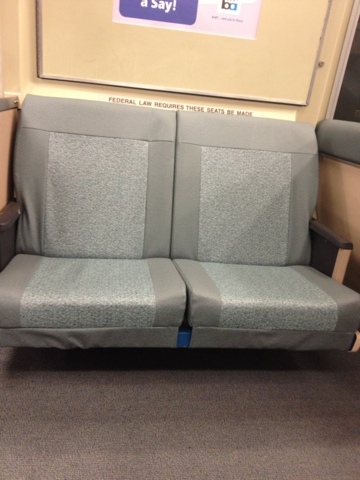 Hope these seats will make BART and the permanent scent a bit more bearable. 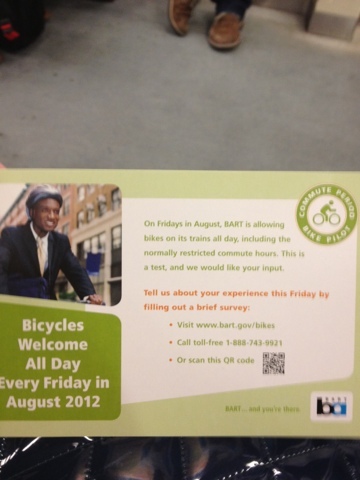 Shouldn't "No Bikes on BART" be extended to "No Shopping Carts on BART" as well?? I'm sure you all agree, you'd much rather allow a bike than a shopping cart filled with trash, old food, cans/bottles, and unwashed clothes on the train??? Right?? Well, this morning, the train operator screams over the speakers for a man with a bike to get off the train. "No bikes on this train. This is a commuter only train. Please exit right now or this train will go out of service!" Wow, I thought, with a threat and all. She's a tough one. I felt bad for the guy on the bike but continued on with my Twitter feed. Two stations later, a homeless person with a huge shopping cart, pushes his way through a crowded train. It was unbearably cramped, not to mention, the smell was also unbearable! We all waited for the train operator to shout through the intercom again, but she didn't. Someone spoke up and told the homeless man that there just isn't enough room in here, but of course, he remained inside, in fact, he sat down and even stretched his legs. At that point, all I could do was be grateful that he got on at West Oakland, and I am 5 minutes away from semi-fresh air (sorry, BART station air is not fresh.) Once we arrived at Embarcadero, everyone dashed out as fast as they could. What's the policy for shopping carts?? For homeless? Are we lenient on the homeless on purpose? I am fine with them seeking shelter in the stations, but on the trains as well? What do you guys think? Is it just me or are there more and more canine passengers on BART now? I don't mind personally, since I love dogs, and as long as they aren't violent to other passengers and the owners clean up any messes, I'm all for it. Long ago, I'd only see service dogs once in a blue moon. These days, I see pets of all sizes, not service dogs, riding on BART. Some standing, some held, some crated, some sleeping and some (see picture) even taking their own seat! Some passengers mind, but for me, it cheers me up from my dreary ride. 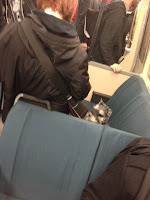 This cute little Scottie took a seat with his owner during the whole ride. Should BART loosen its no pets policy? I think not since there are sadly plenty of irresponsible pet owners out there that will cause problems. But maybe one pet-friendly day might be fun! No? Thinking I'll start a series of short posts simply on BART ironies. Today, 2 of 3 turnstiles had a handwritten "NO CLIPPER" paper over the Clipper card sensors. Only, it wasn't just today, these signs have been there since last Tuesday, more than a week ago. Those of us who use Clipper cards had to form a long line to get through using the only working turnstile. Why should commuters ditch BART tickets for Clipper cards when BART can't even get a sensor fixed in a timely manner? Just ironic given how hard BART has been pushing Clippers. I wonder if the turnstiles will still be broken tomorrow-- somehow, I'm thinking YES. Would you confront a high, belligerent passenger on BART? I'm typically a pretty outspoken person but on BART, I am usually non-confrontational and try to be low profile. Very unlike my usual self but after nearly a decade of taking BART, I've also learned to just mind my own business and get the **ck out of there as soon as I can. Yesterday evening, a drunk, drugged, belligerent homeless woman was SMOKING inside the train. I was pretty far away, fortunately, but saw the entire situation. A woman told her there's no smoking, she screamed profanity, then another passenger called the train operator, causing the homeless woman to spit on the person. She got ejected, and on her way out, she was spitting (yes, spitting) on all the passengers in her way, screamed in people's faces and then pounded madly on the train window. The entire train was filled with smoke and stunk the entire ride. Would I have told her to put out her cigarette? I honestly don't know. I've been verbally harassed by so many homeless near the Civic Center and Powell stations that I've learned to just walk as fast as I can, or just walk away. But yet, in any other situation, at a restaurant for example, if a patron smokes, I'd have no problems walking up to them and ask them to put the cigarette out. This morning was one of the worst rides in awhile. It was a combination of many of my pet peeves in one ride but I'll share the top 5 so you're not overloaded with unpleasant visuals at the same time. It was an overcrowded train but people kept piling on. Why can't BART have a max capacity censor that is loud and clear?? There was NO ROOM to stand, at least not straight, and people are crammed so tightly that they are practically spooning. An older woman was leaning on me for balance. If she wasn't an elderly, I would have said something. When people are forced to smell each other, any trace of cologne makes the ride even more unpleasant. Cologne makes people sneeze, and when people are sneezing in such tight space, germs spread. Once this man with slicked back hair and powerful cologne walked in, at least 4 passengers within the vicinity started sneezing continuously, including yours truly. At least i covered my nose!! Others didn't! Let's just say I'm going to need to dry clean my pea coat! Why won't people blocking the doors step aside to let people exit??? And even worse, when I politely step out to free up the entry, how is it that someone inside the train take my standing space??? I couldn't stand it today and reminded that person that space was mine. It was so crowded that without the space, I wouldn't fit on the train. And how can a polite action such as stepping aside to let people through end up be a punishment? I couldn't let that happen! Large suitcase backpacks have become a trend these days. Tumi, Samsonite all make these fancy suitcases that go easily on your shoulders. The downside? They are too large to keep on during a crowded BART ride and they are dangerous. A Tumi backpack straight punched my face today when the clueless passenger turned a different direction. PLEASE, when the train is a max capacity, take your backpack down before you hurt someone. Coffee and breakfast items on a maximum capacity train is 10X worse than it typically is. Today, the stop and go motion made several coffee cups spill, and someone's disgusting smelling sausage mcmuffin drop to the floor. Thank goodness that was a few feet from me because if that touched me in anyway, I would probably have blown up! Let's hope the ride home will be a little more pleasant!!! This was one of the worst morning rides in awhile!! What ticks you off? ?